contemplation as opposed to manifestation. how many times have we pondered over something but in the end have not the energy nor the decisiveness to manifest it. i have had many such moments in life, and when the opportunity passes us by, the only remaining companion is regret. 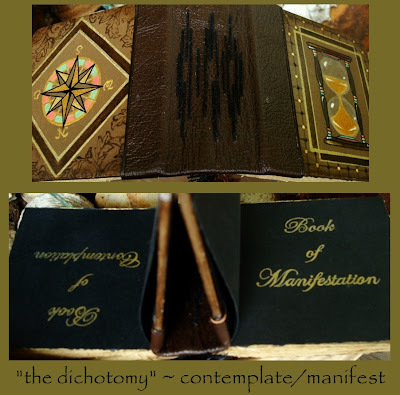 this little book i made is called the book of dichotomy. it addresses the issues above. one half of the book is called the "book of contemplation" ... and when you turn it over the other half is the "book of manifestation". visually, it is inspired by the latest harry potter film "the half blood prince". 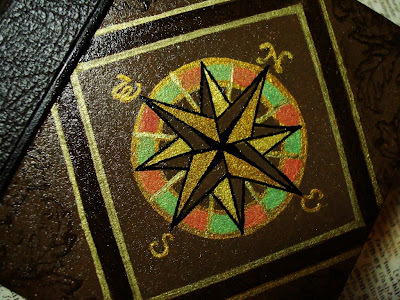 the compass symbolizes contemplation ... searching for a direction or pondering for an answer. on the other half, the hourglass reminds us that time does not wait and if we are indecisive we will run out of time or the opportunity to manifest our desires. in a way it also reflects harry's journey in book 6 ... he is searching for answers and time is running out. when dumbledore dies, harry loses a mentor and for a moment he also loses direction. the last scene in the movie which i thought was most beautiful, is when the 3 friends harry, ron and hermione, look out into the horizon, and even though time is still not on his side, harry have once again found some sort of resolution ... he's rediscovered his direction. 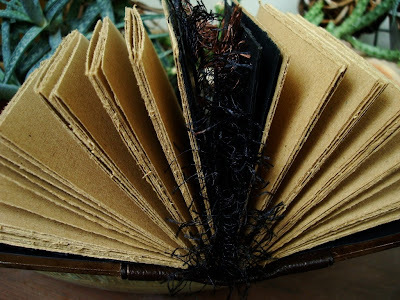 the pages are made with brown recycle paper except for the center signature, which is in black. all the pages have been hand torn. 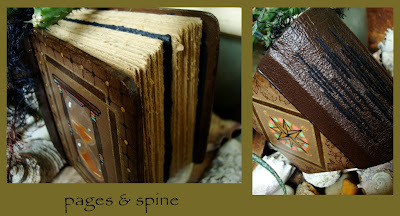 the spine is leather (you all know where that came from :o) ) and the signatures are hand sewn on the spine with double black thread. 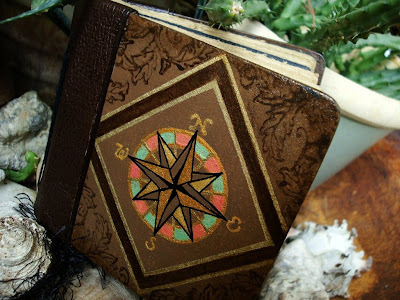 the book titles are written in metallic gold ink and sealed with a fixative. the covers are hand painted with a bit of rubber stamping work. the covers are stained on the edges to give it an aged look then finished with 3 coats of gloss varnish. 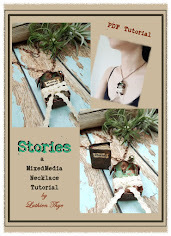 as always :) love to here what you think :)) but you know what ... i'm really lovin' book-makin'!! so i think for a while it'll be books and more books!! That is an awesome book!!! It's absolutely gorgeous! I wish I was that skilled! 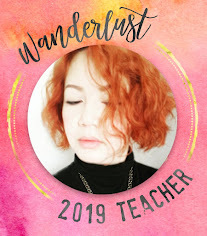 Great blog here. nice to meet another book artist. I love the hourglass. I don't know why, it's just so beautiful. 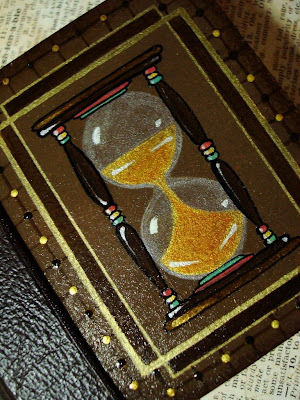 The whole books is gorgeous and impressive, but the hourglass is sort of... touching? thank you very much! and thank you for visiting me :)) hope to see you again!! You are something very special. WOW! This is so up my alley - especially right now! I love how the 'Universe' gives me what I need, when I need it - and reading your post gave me just what I needed today! Well done on the book, Luthien, you're very talented in deed! wow...this book is just soooooo beautiful.